WordPress! is an award-winning CMS, which enables you to build Blogs, Web sites and powerful online applications. Many aspects, including its ease-of-use and extensibility, have made WordPress the most popular blog software available. Best of all, WordPress is an open source solution that is freely available to everyone. There are hundreds of WordPress themes online waiting to be paid for. Some of them are worth it, some are not. Just because many of our followers decided to stay with Premium themes, that doesn’t mean Free Themes are ugly, cluttered, and boring. In this showcase below, you’ll find a Excellent Collection of Fresh High-Quality Free WordPress Themes Around because We all know that we’re going to use our blog as a tool to promote our business, so we need to have a clean, professional, corporate look. Please Notice that these themes is not arranged in any particular order so just scroll down and find your inspiration. Also, Please visit their authors’ sites, available at the “Features” Link, to learn more about each of these themes in terms of various features including good usability, organization, attractive use of graphics, cross-genre appropriateness and even search engine optimization. This is not the traditional long list with all the available WordPress themes on the internet but its an refined collection of best handpicked fresh free WordPress themes which was created with the online professional in mind as we also know that Personal blogs reflects the identity of each of us on the Internet. So, Let’s start with this compilation that every web developer, designer and freelancer should consider. Just make sure to read the license agreements and installation instruction carefully as they can change from time to time. Hello, iShift was accidentally founded by a group of professionals. One of them is me, DKumar M. , an Asian freelancer who is still single. My work covers advertising, consultation, programming and web design areas. Thanks for the resources. I have been looking into redesigning my print and design blog for my client. I am sure one of these themes will make a great fit. Wow, impressive collection for wordpress, i like them, even more the themes that are adapted to mobile phones. Hi, it’s a great of free wordpress themes collection. Great collection. Thanks for posting this. Found so many great themes. I haven’t had the chance yet to look through a large amount of these, but from what I can see I have to agree with Arshad Cini, this has to be one of the better collection I have come across this year. It is a rarity to come across this amount of high quality WordPress themes in one place. There are a number of these themes that are inspirational in there style and layouts. Thanks for sharing. 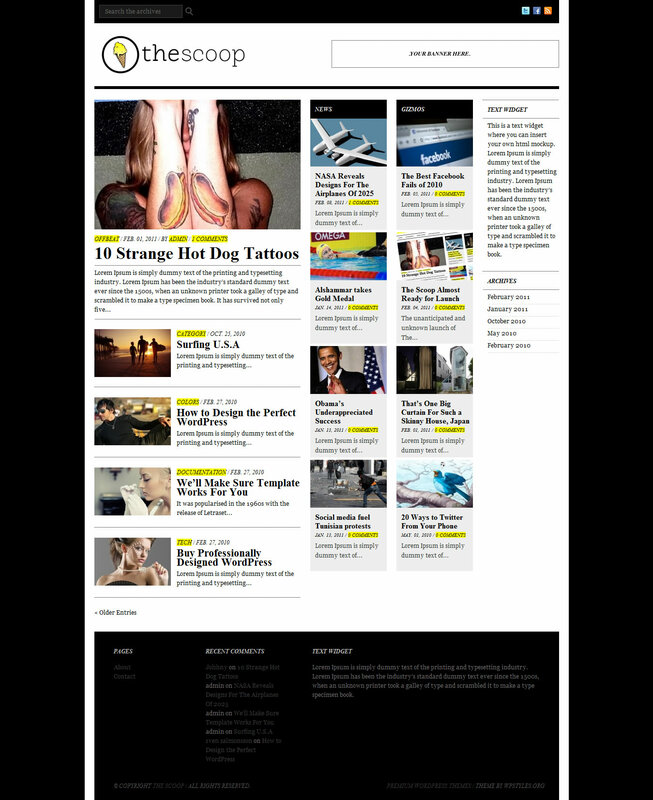 I’m very surprised you are featuring themes that have not been updated since 2009 (MagZine). There are numerous reasons why you shouldn’t be promoting such themes, the TimThumb vulnerability just one example. Secondly, a schedule of posting must have a systematic approach, for a long time, to make the readers familiar with it. At the end of the week or at the beginning, it is better to publish something “light”, for example an inspirational showcase to relax and inspire any visitors. The mid week is perfect to post articles which are more difficult (tutorials or in depth articles) or contain more information because the users reach their superior productivity. Great Collection Dkumar, Some of them are responsive themes, you have collected in this collection, The only problem with these themes i have seen in these years are – They are not designed to monetize your blog, As you have done in your theme. Thanks for the best collection of wordpress themes of various categories, look to buy a couple of themes. Thanks for this great post it was very informative and helped me with my own project I am attempting to complete. Color way design is good and if you want you can also check 1000s of beautiful designs on webstarttoday.com. It’s a free website builder newly launched in the market and they are offering free websites and you will love the designs. The best, thank you from Russia! Great collection. I was searching for best available themes for wordpress and i found this website as the best website. Thank you for sharing. Please keep it up. Hi please include some of our Free Awesome WordPress Themes over at bodegazine for your 2012 Collection! Thanks a lot. I’d like to download the desire WP theme but the domain name iwebnet.org has expired. Does anyone have its zip in stock? The quality of most of these themes is just great. Hard to believe they are free! Excellent wp theme collections keep it up. Thank you for sharing this wonderful collection of free wordpress themes. It can be a jungle to find some relevant themes but your article was very helpful. Thanks for an amazing collection! Themes in Clean collection has a really nice look. The best wp theme collection. Thanks for post. Great list! The Woolies have found a theme!